Almost five years ago, Laurent Tshimanga was 19 years old and had never played a down of football in his life. But there he was, awaiting a handoff from his quarterback, as his team had the ball on their own 20-yard line on a sunny day in the Merseyside, a northwest county in England. The end zone was only a mere 80-yards away. As the play begins, Tshimanga receives the ball from his quarterback. He begins to run upfield before a defensive lineman stands in his way. For a rookie running back, getting smothered by a lineman could have been an unhappy “welcome to football” moment in one’s career, and to have it happen on his very first play could have been disastrous. But as the defender drew closer to the running back, Tshimanga stiff-armed him and threw him on the ground. It could have easily been a 10 or 12-yard debut run for the rookie. But he kept running. Two cornerbacks converged on Tshimanga in the hopes of stopping the play, but the running back blew through them like saloon doors at a bar. Soon enough, Tshimanga had found daylight and then, paydirt. Just before he scored, the rookie turned around and stepped backwards into the endzone, taunting the opposition. Granted, it was his first ever football play, so maybe he did have the right to show off in that moment. “Nobody ever expected me to [score] an 80-yard touchdown on my first ever play.” Tshimanga said. Four years later, Tshimanga splits his time with the Liverpool John Moores University Fury and the Merseyside Nighthawks in the off-season. In seven regular season games for the Nighthawks this past season, he scored 19 touchdowns, good enough to be named his team’s most valuable player on offence during a team banquet in November. Tshimanga was born in Congo and moved to England—a land associated with footballing heroes such as Steven Gerrard and David Beckham rather than Joe Montana and Jerry Rice—when he was around six or seven years old. His father was looking to obtain a Master’s degree at York University, and following graduation his family settled in England where they’ve remained ever since. 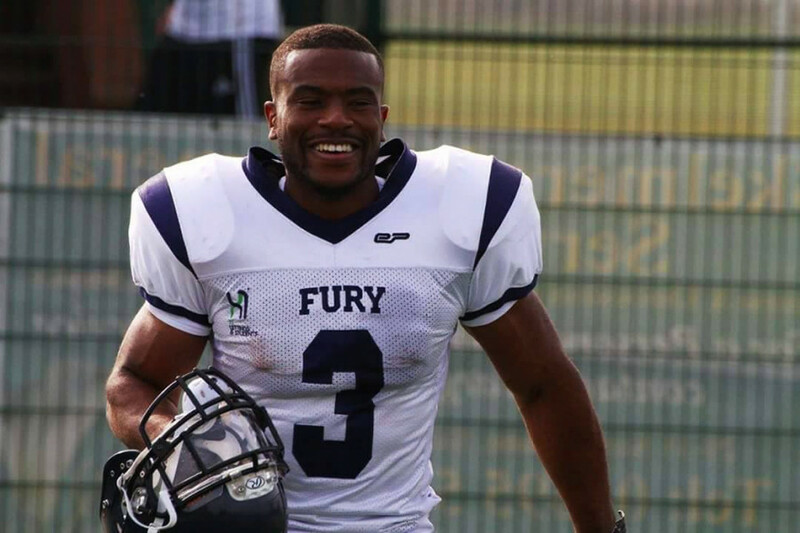 Four years ago, Tshimanga began his degree in Business Studies at Liverpool John Moores University, where a friend coerced him into trying out for the American football team. He did have his difficulties playing the game and admits he almost gave up the sport entirely, before his playing career truly took off. During a practice at LJMU camp in 2012, one of Tshimanga’s teammates fell on his knee, tearing its medial collateral ligament. As a result, Tshimanga was forced to sit out for an entire season. Instead of giving up on his newfound sport, he rehabilitated. He spent time in Congo and even underwent physiotherapy before returning to the university team in September of 2013 to practice. Once he got his feet wet again with the university team, Tshimanga was healthy enough to join a club team, the Merseyside Nighthawks the following summer, where they captured a division championship in 2014. 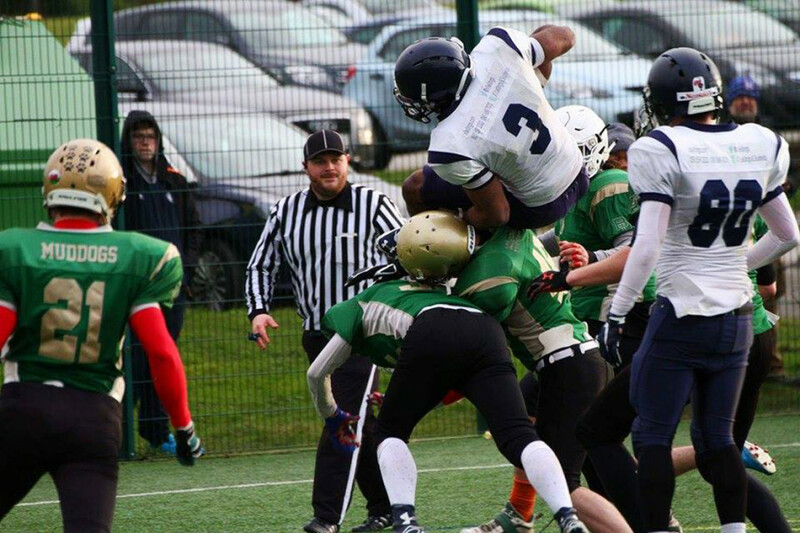 The Nighthawks have since repeated as champions again this past September and were promoted to the top division in American football in the UK, the Premiership. The team has remained undefeated for the last two seasons. Following the division championship in 2014, Tshimanga again tried out for the national squad amongst 150 players, including “10 to 12 running backs”. Tshimanga admits he didn’t “shine” in his tryout, until one fateful play that he believes, changed coaches minds about him. The back took the ball and made a defender miss, allowing him to run into the end zone untouched, drawing the attention of coaches. As a result, Tshimanga has now drawn invites to try out for the Great Britain Senior Men’s team. Tens of thousands of fans took in an encounter between the Kansas City Chiefs and the Detroit Lions on Nov. 1. Instead of Ford Field in Detroit, or Arrowhead Stadium in Kansas City as the home site, both teams fought on neutral ground; Wembley Stadium. Since 1991, the National Football League has ventured into Europe, specifically the United Kingdom. Upon the creation of NFL Europa, a franchise had been formed in London, known as the Monarchs, and remained until 1998. Scotland even had a football team, the Claymores, formed in 1995. Alas, NFL Europa didn’t make much money, failing to make a profit throughout its lifespan, leading to its operations being ceased in 2007. While NFL Europa is no more, it hasn’t stopped the NFL from bringing actual league games to the UK. Since 2007, the NFL has played at least one game a year across the pond through the International Series. Despite being regarded as “international” in name, all of the games have been played at Wembley Stadium in London since its inception. However, Twickenham Stadium, home to the England national rugby team, will see at least two NFL games over the next two years. The new home for English Premier League club Tottenham Hotspur will also host games once it has been completed in 2018. At LJMU, Tshimanga’s final-year project will surround the viability of NFL games in London, and discussing the expansion of its network into the UK. Since 2007, Wembley Stadium hasn’t attracted a crowd less than 76,981 fans for a football game. The stadium’s capacity crowd is 90,000. Fans continue to come out in droves to watch, but they’re looking to play even more as well. According to the NFL, amateur football has grown by 15 per cent annually since 2007, and their “latest figures” show that over 40,000 people over the age of 16 play football. Despite the numbers, there are still people in the United Kingdom who haven’t a clue about the game. “First initial reaction is always like, ‘What? There’s American football in England? So people don’t even know it exists,” said Tshimanga. The Nighthawks are a part of the growing British American Football Association, recognized as the governing body of American football in the UK. Through the body, there are men’s leagues, women’s leagues, and football leagues for under-19 year olds. Tackle football and flag football leagues are also present. One can become a referee, a coach, or volunteer to teach through the program as well. According to Tshimanga, during the team’s last open tryouts, around 500 athletes were interested in the last camp the Nighthawks had. In the present, the running back trains for football up to four times a week—two times more than his university teammates—frequenting the gym, doing sprints and weights to pass the time. In the off-season, he sometimes calls up a quarterback from LJMU and run routes as he gets thrown the ball. When he isn’t playing football or taking classes, he provides stadium tours at the Anfield football stadium. It is home to the famous Liverpool Football Club—they play “soccer”. Visitors from France want guided tours of the stadium, so Tshimanga, who speaks French fluently, often leads them. Funny enough, Tshimanga is a supporter of Arsenal. “It’s a bit like two parallel worlds,” he said, comparing his football life to his other football life. Tshimanga was among the many fans in attendance during the Chiefs-Lions game, and had his opportunity to flex his arms on the stadium’s jumbotron, but his focus was on a particular running back he admires; return specialist and noted speedster, De’Anthony Thomas. Thomas is three inches taller than Tshimanga—the latter being five foot seven—yet he is still one of the two model examples the Brit follows. The other being the Seattle Seahawks power running back Marshawn Lynch. The dream for Tshimanga is to take his talents across the pond to America and play alongside his American compatriots, something he has considered as a plan post-graduation. “A lot of people tell me that if you are passionate about something…they tell me I should take a chance, take a leap of faith,” said Tshimanga. There are a few British-born players that Tshimanga could look to for inspiration. Fellow running back Jay Ajayi, born in London before moving to the United States in fourth grade, has found a home on the roster of the Miami Dolphins. Linebacker Jack Crawford, also a Londonite, played for the Oakland Raiders before joining the Dallas Cowboys in 2014. Osi Umenyiora, a former defensive end, was also born in London before he moved to the United States. He has won two Super Bowl championships, both with the New York Giants. It is a dream for Tshimanga, but he has other options he has to consider. He has considered returning home to Africa to find employment, potentially working in a bank just like his father. There is also the option of staying in Liverpool and finding work, and remaining with the Nighthawks. America, whether for football or not, would be an opportunity for Tshimanga to “try something new,” and his year in football is something he cannot put aside and not consider. The Colin Kaepernick Saga: Are We Missing the Point?